Wonderful, carved natural, un-treated coral carving, depicting dragon. This plaque for pendant with exquisite carving measures 47mm x 35mm. It is in very good condition. Weight is 8.92 grams. 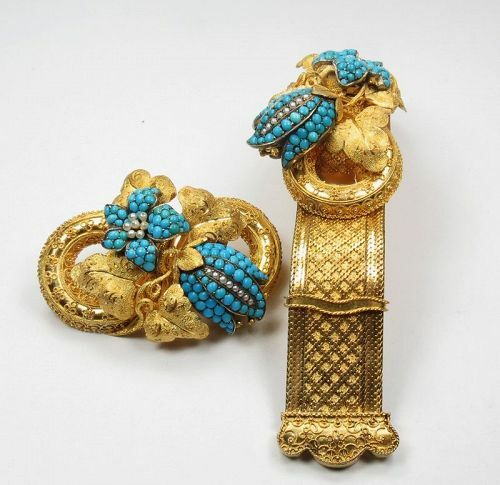 Spectacular, Victorian sliding bracelet and brooch set, composed of 19k (or higher) yellow gold, Persian turquoise and natural seed pearls. The bracelet is 3/4" wide, the top part with gemstones measures 2 1/8" x 1 3/8". Matching brooch measures 2 1/8" x 1 1/2". The set is in excellent antique condition. Bracelet will fit any size wrist. Weight is 86.40 grams. 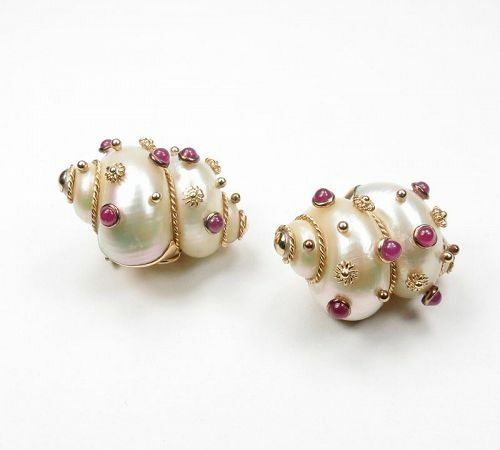 Wonderful pair of 14k gold, white sea shell and ruby earrings signed MAZ. These clip on style earrings measures 1 1/8" x 1 1/8". The earrings are in excellent pre-owned condition. Hallmarked 14k Maz. Weight is 24.78 grams. We do have another pair of Maz shell earrings available, listed separately. 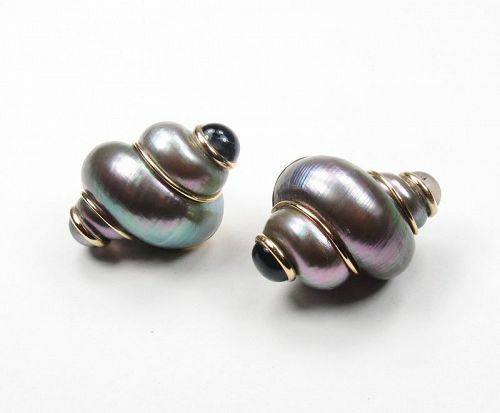 Wonderful pair of 14k gold, grey sea shell and amethyst earrings signed MAZ. These clip on style earrings measures 1 3/8" x 1 1/8". The earrings are in excellent pre-owned condition. Hallmarked 14k MAZ. Weight is 19.35 grams. 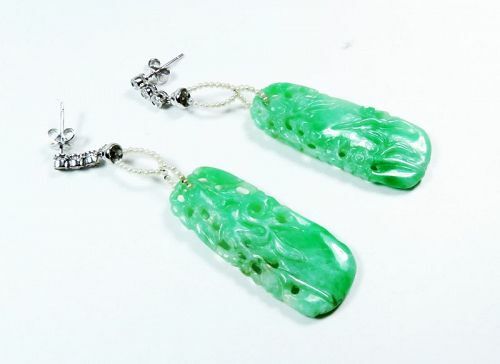 We do have another pair of MAZ shell earrings available, listed separately. 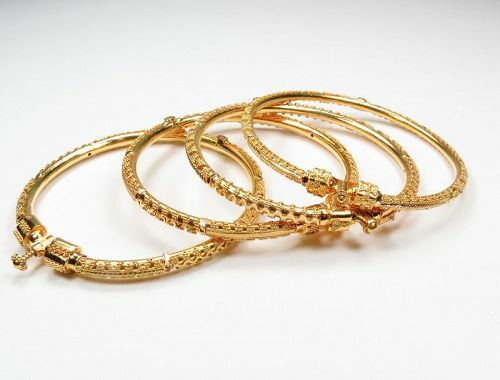 Super elegant, set of 4 bangle bracelets composed of solid 22 karat yellow gold. Each bangle measures 2 3/8" in diameter and it is 3/16"-1/4" wide. The bracelets are in excellent pre-owned condition. Gold is marked 22k. Weight is 57.66 grams. We can sell each bangle separately as well. 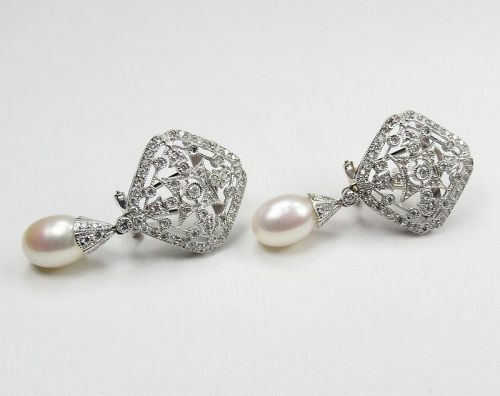 Exquisite pair of 18k white gold, cultured pearl and diamond earrings. These omega style earrings are in excellent pre-owned condition. These are 1 1/2" long x 3/4" wide, they consists of about 1.8ctw of sparkly diamonds. Gold is marked 750. Total weight is 9.7 grams. Fine, antique, 15k yellow gold brooch with natural seed pearls, Demantoid gemstones and diamonds. The brooch, which could work as a necklace; measures 2 3/8" x 1 7/8". 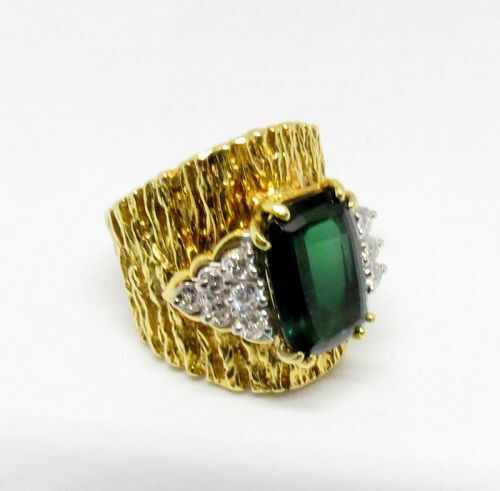 It consists 10 small Demantoid gemstones and 6 sparkly diamonds. It is in very good condition. Weight is 11.28 grams. Spectacular, vintage brooch composed of 14k yellow gold, natural un-treated salmon color coral and Lapis Lazuli. This very detailed brooch measures 2 7/8" x 1 7/8". It is in very good pre-owned condition. Weight is 30.4 grams. 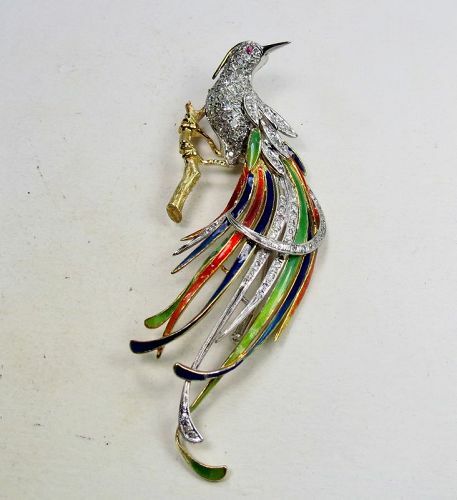 A fantastic, circa 1970's, 18k yellow gold, 1 carats of diamonds, enamel Bird Of Paradise brooch pin. This exquisite brooch measures 3 1/4" x 1 1/4". It is in very good pre-owned condition with some enamel ware. Pin is hallmarked 18k Italy. Weight is 22.5 grams. 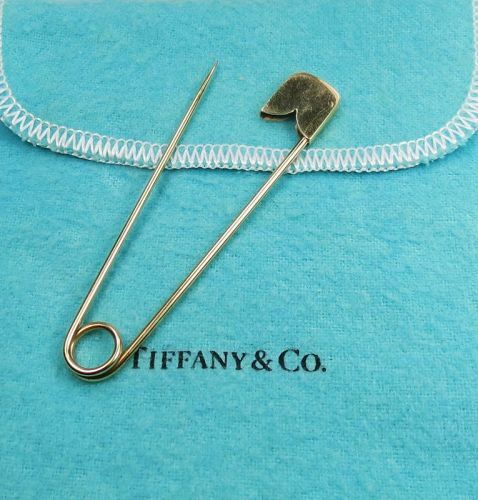 Elegant, vintage, circa 1950's, Tiffany & Co, solid 14k gold safety pin. This large, unisex brooch measures 2 7/8" x 1/2". It is fully hallmarked; 14k Tiffany & Co. Condition is very good. Total weight is 5.5 grams. 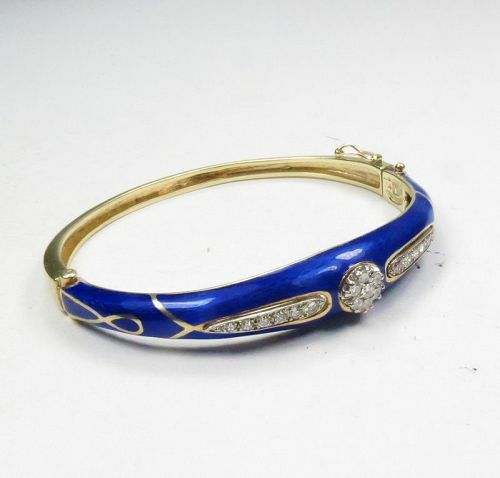 Gorgeous, estate, 14k yellow gold, royal blue enamel and diamond bangle bracelet from LA TRIOMPHE collection. The bracelet measures 2 1/4" x 1 7/8" in diameter, front is 7/8" wide. 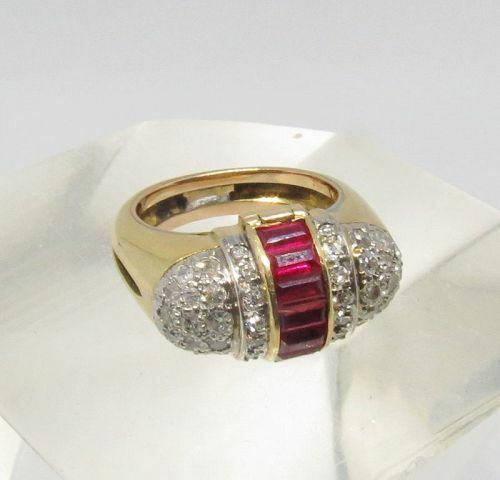 It consists 19 top quality diamonds of approx. weight of 1ctw, F color, VS1 clarity. The royal blue enamel is in perfect condition. Bracelet total weight is 22 grams. Lovely pair of 14k white gold and diamonds chandelier earrings. The earrings are for pierced ears, measuring approx. 2 1/4" long, x 3/4" wide. The pair of earrings consists of over 1 carats of sparkly diamonds. Earrings are in excellent condition. Weight is 9 grams. 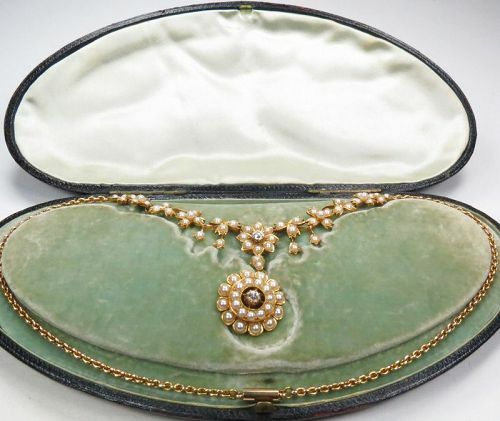 Antique, Art Nouveau, 18k/14k pearl garland necklace in fitted box. Fine, antique, 18k yellow gold, pearl and diamond garland necklace with 14k gold chain in original box. 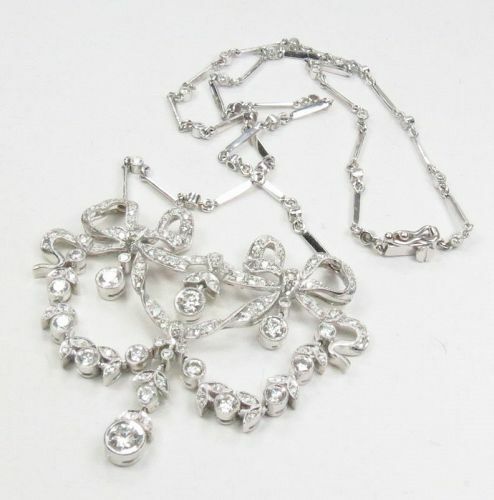 This amazing necklace is in excellent pre-owned condition, measuring 17" long with 2" drop pendant. The necklace dates to Art Nouveau or Edwardian Era. All the natural pearls are present, this fabulous necklace consists of approx. 0.45ctw of H color old cut diamonds. Gold was tested and guarantee as stated. The necklace comes with its original fitted box. Weight is 23.8 grams.